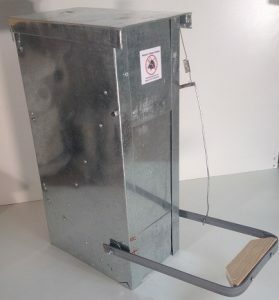 The small rat proof treadle chicken feeder hopper holds 12 pounds of laying pellets or other feed and has a 100% galvanized sheet metal feed tray and hopper so the feed flows easily and sanitation is assured. Generally a laying hen eats around 4 ounces of feed per day, so one pound of feed should feed four birds one day, 7 pounds per week per four birds, or a little less than 2 weeks per full hopper of feed for a four hen flock. Approximate assembled size of the medium feeder is 18” deep x 10” wide x 19” tall. Shipping weight is around 12 pounds with packaging for the medium rat proof treadle chicken feeder. The small automatic feeder is good for about six hens as only one bird at a time can eat unless they get along well. Six hens will take turns eating according to pecking order The medium feeder is 4″ wide so two hens can eat at once. That will of course vary depending upon how established the flock is and your goals for the birds. If they are layers you need to make sure there are no more than 12 to 16 hens per medium feeder because a laying hen needs to eat as often as possible for full egg production. The more she eats the more eggs per week she can put out as protein consumption is usually a hen’s limiting factor. If you are feeding out broilers the weight gain per day is as important so once again you should have one feeder for every 12 to 16 birds. If a flock is well established there will be a pecking order and you can go as high as 20 birds per rat proof poultry feeder as long as you don’t mind a few less eggs per week. Another thing to consider is that the more poultry feeders you have the more likely one will be unused at any give point in time so once you get past three automatic feeders you can easily go as high as 25 birds per feeder. That would give you four days of feed per 25 birds. There is the standard or original small feeder intended for indoor use or at least under a cover to keep heavy rain off the door. 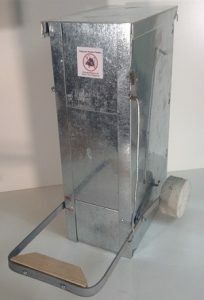 There is an exterior rodent proof chicken feeder version suitable for outside use. To order this just order the original small treadle feeder and add the exterior upgrade kit that is found in the parts section. There is a soft close version of our wild bird proof feeder too. To order this version just order the small treadle feeder and the soft close retrofit kit in the parts section. There is a soft close exterior version. Add both the soft close kit and the waterproof kit to the small feeder order. The opening is 4″ narrower than the medium. This rat proof poultry feeder is made for smaller spaces such as chicken tractors where space is limited. Left side showing the narrow and distant treadle. You can add a plywood treadle step extension but that reduces the rat proof qualities so trim the wood platform down after a few days. The spring keeps the door tight and prevents several rats from just pushing the door open. This is actually a medium feeder but it shows the inside of the feed tray with the sloping bottom that brings the feed down to the bottom of the feed tray. The small feeder is 4″ narrower than the medium sized feeder. The concrete counterweight balances the weight of the door, treadle bar, and wood treadle step. 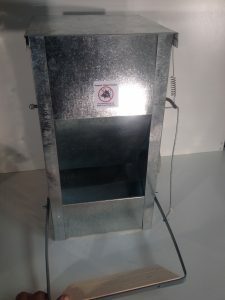 The step is narrow and distant in order to make this feeder a truly rodent proof chicken feeder, this is the only treadle feeder on the market that is completely rat proof. A swarm of rats could overwhelm the door by pushing their way in if there are enough rats but what will happen is that the rats will climb in side and smother themselves once the door closes on them. Once this has happened once reports state that the rats will never touch the feeder again. This is a rare occurrence but has been reported twice and both times the rest of the rats either starved or left for good. There is an exterior version suitable for outside use. To order this just order the original small feeder and add the exterior upgrade kit that is found in the parts section. There is a soft close version. To order this version just order the small feeder and the soft close retrofit kit in the parts section.